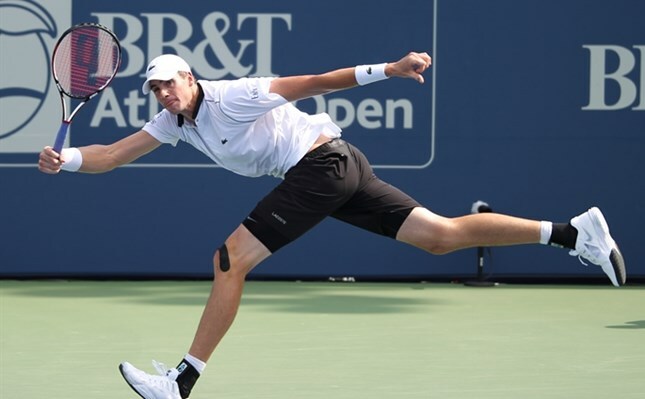 30-year-old John Isner trying to three-peat and gain entry into his fifth BB&T Atlanta Open final and 22-year old Denis Kudla in his first ATP World Tour semifinal and making a move well into the top-100 in the world rankings. Kudla didn’t give Isner a chance to get on rhythm in the first set as he moved the 6’10” player from the onset. After six uneventful holds, Kudla earned two break points after getting multiple good looks on the defending champ’s serve and a break in the seventh game to take the first set 6-4. The world No. 19 ended up winning a paltry 27% of points on his second serve in the opener. Isner bounced back in a big way in set two with a more aggressive mindset. The former University of Georgia All-American closed out the second set 6-2 without dropping a point on serve. It looked like going to a third set favored Isner. Coming into the semifinal, Isner was 9-3 in three set matches in Atlanta and had won four straight. Isner earned three break chances in the final set before converting one on a match point at 6-5. “When he serves that big, you kind of get stuck in neutral,” stated Kudla after the match. Kudla said that even in defeat, he’ll take a lot of positives away from his week in Atlanta. Kudla’s next stop is the Citi Open in Washington, D.C. Isner’s next stop is another final in Atlanta on Sunday with a start time of 3 p.m. Naturally, being in his fifth final in six years, Isner feels comfortable on the fast and high-bouncing courts at Atlantic Station. Singles Semifinal result: John Isner def. Denis Kudla 4-6 6-2 7-5.